Lets see them horses that you've been working on! Re: What's in the Studio? I'll share what I have in my studio! Been working on an Andre resin by Sarah Rose. Too bad this is a commission piece. Oh WOW! Someone is lucky lucky lucky!! Ahh Andre! <3 He's looking good in dapple grey! 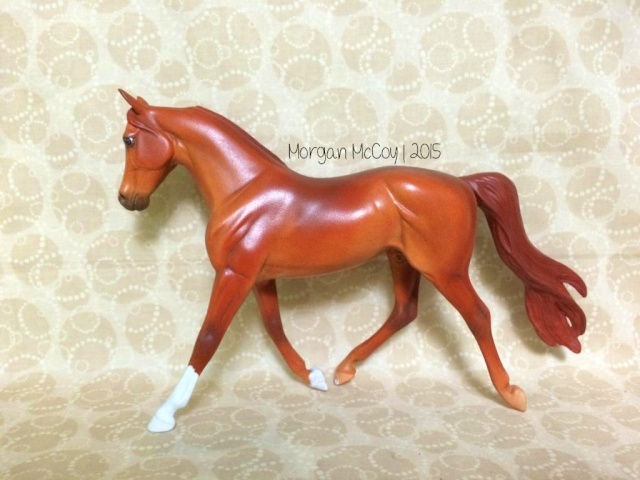 Here is one of my horses that i've been working on, she is a chestnut classic Morgan mare. I actually haven't worked on her since before Christmas. I really should do that She was actually done in all pastels without an base coat, so i'm happy with her so far. I'm hoping to finish her up next week when i finish all of the other ponies that are in progress. What a lovely chestnut color! The shading is wonderful on her! Great job so far! Here's another horse I'm working on right now.